Owain Sparnon was selected as the Raising The Bar Residency recipient for 2017, working in the Jane Phillips Award studio during August. Read more about his time within the studio here. “I was thrilled to accept the residency I was given by mission gallery through the Jane Phillips Award. 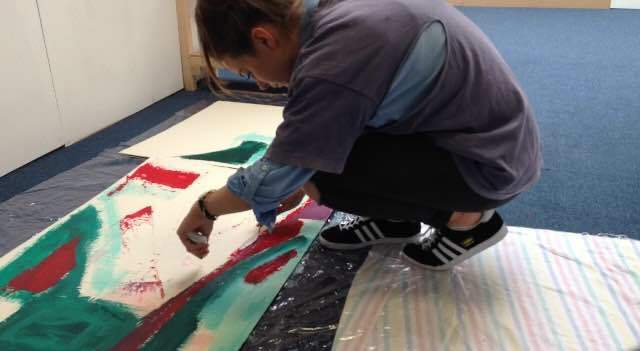 I had just finished my art foundation and was starting my Degree in Fine Art and History of Art in September, in the summer break it is hard to keep being creative and productive so the opportunity to have a studio was fantastic. The studio was a space I could both think and make, with no pressure of outcomes it was purely a time for me to explore my subject further, and that is exactly what it has allowed me to do. I have recently been working with the medium of video but I wanted to get back into painting. I had three canvas’ with work I had done a few years back in which I thought didn’t express who I am as an artist, I took these pieces and worked back into them. I am really interested in the concept of how an artist interacts with a canvas and how every mark that artist makes is completely individual to them. Like Bruce Nauman I want to use my art as ‘ an extension of my own body’ so I spent a number of days in the studio filming myself paint, intrigued to see how I interact with a painting and, how the measurements of my body can provide a scale that maps and documents my interaction with the piece. I am also very interested in the subconscious gestures we make when working, e.g the spreading of a hand over an unknown texture or the gentle step we take back to gaze at our work, to quote Bruce Nauman again, ‘ The process of the work is as important as the work itself’ and this is what I explored in my time at my residency. Throughout my stay at the studio, I had time to question myself as an artist, how I produce work, how I explore concepts, who inspires me, what inspires me, what I want to say through my art, I had time to stop and think.